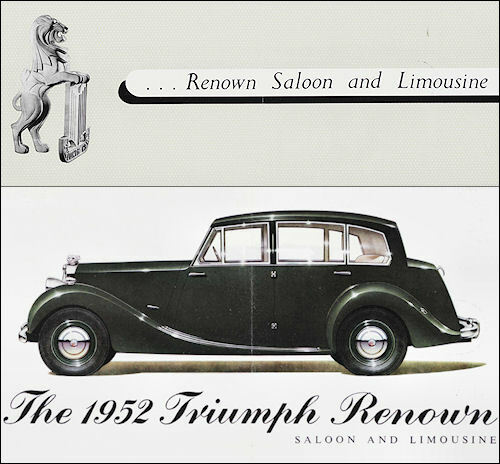 Renown long wheel base standardised from 1952. 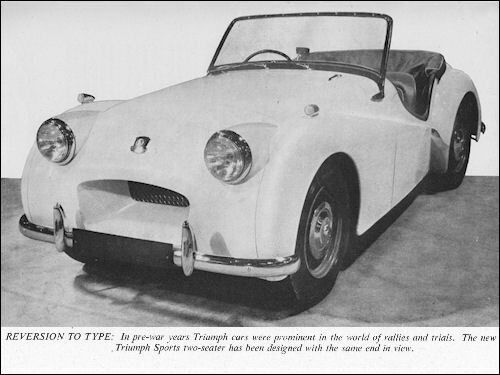 Triumph Sports (prototype, Model 20SR) 2-litre-engined sports car was first shown at the 1952 London Motor Show. The two-seater bodywork feature a rectangular open air-intake at the front, long front wings and a short rounded tail on which the spare wheel is mounted; it is supported by the fuel tank filler pipe. Luggage space is very limited. Na salonie w Londynie zaprezentowano prototyp Sports ze zmniejszonym do 1991 cm³ silnikiem Vanguarda i przednim zawieszeniem zaadoptowanym z Mayflowera..
TDB (4cyl, 2088 cm³, 68 KM) - end of prod. 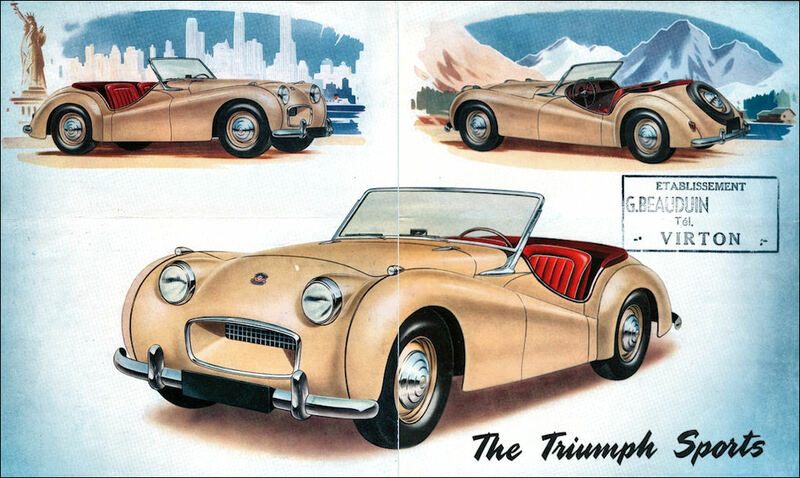 In pre-war years the Triumph Motor Co. gained many successes with the sporting cars in their range of models, especially in the Alpine Trial and Monte-Carlo Rally. 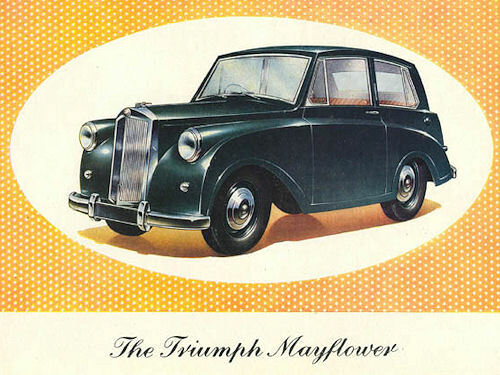 In the light of post-war events it was therefore not unexpected that the Triumph range should again include a sports car, and it is interesting to see that this new design is designed to give a very high performance in the hands of the ordinary user, to be of the simplest possible construction, and to sell at a moderate price. 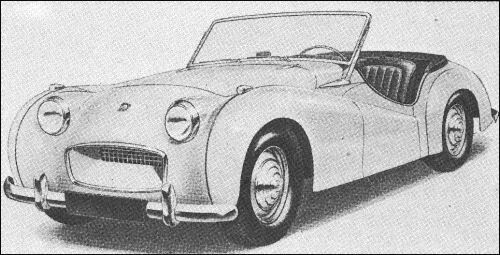 Reference to the specification shows that the theme of the design is the installation of a comparatively large engine in the smallest and lightest practicable motorcar. The wheelbase of 7 ft. 4 in. is, in particular, exceptionally short, and a 3 ft. 9 in. track is also a little less than is normal to this type of car. The overall dimensions reflect a certain amount of overhang, but the very compact grouping of the mechanical structure has resulted in an exceptionally low estimated weight of 15¼ cwt., and even should this be exceeded slightly in the production models, an all-up weight, with driver and passenger, of one ton appears well within the realms of possibility. Even on this perhaps pessimistic estimate the car will dispose of 75 h.p./laden ton, displace 3,100 per ton-mile on top gear and have over 120 sq. in. per ton of friction lining area. Figures of this order will provide acceleration and hill-climbing of a very high order despite the use of a top gear which permits a cruising speed of 80 m.p.h. at 2,500 ft. per min. and an estimated maximum speed of 90 m.p.h. These figures derive from the use of a short-stroke 2-litre engine (83 by 96 mm.) which is a developed version of the four-cylinder power unit used currently in the Triumph Renown and previously also employed in the Triumph Roadster. As is well known, a distinctive feature of this engine is quickly detachable wet cylinder liners and by adding 1 mm. to the wall thickness of these sleeves the swept volume of the engine has been decreased from 2,088 c.c. to 1,991 c.c. (with a corresponding reduction in piston area) so as to bring the car within the 2-litre class for competition events. The manifolding of the engine has been modified in that a single downdraught fixed-choke carburettor has been replaced by two semi-downdraught S.U. constantvacuum carburettors, the peak of the power curve being thereby shifted from 4,200 up to 4,500 r.p.m., the peak of the torque curve having gone up from 2,000 r.p.m. (128 lb. per sq. in., b.m.e.p.) to 2,600 r.p.m., at which point 130 lb. per sq. in., b.m.e.p. is realized. A normal rear axle with hypoid bevel gears is used, the engine being connected thereto by a four-speed gearbox synchronized on second, third, and fourth ratios, the estimated maximum speeds on the three indirect gears being 24, 45, and 70 m.p.h. respectively. A centre gear lever with remote control is provided. The frame consists of a simple structure with box-section side members and a distorted X-shaped centre bracing made from an open channel which connects four points to the side members by tubes which also act as body mountings. There are in addition a tubular rear cross-member, and a deep front cross-member which also gives support to the front suspension elements. These consist of fabricated wishbones connected to the front wheels through the medium of a ball-and-socket joint, the suspension itself being by open coil springs which surround direct-acting telescopic dampers. In order to increase the inertia of the front end of the frame structure a large-diameter tubular cross-member is used to join the top mounting points to each wishbone and yet further stiffness is added by a small diameter cross-tube at the extreme nose of the car. Worm-and-nut steering is used in conjunction with a three-piece track rod and despite the short wheelbase of the car the front of the engine timing cover is not placed forward of the front wheel centres. The rear axle is joined to the frame (which passes beneath it) through leaf springs which also drive the car, and these run downwards towards the front so as to promote an under-steering tendency as the car rolls. In view of the low centre of gravity it has not been thought necessary to provide an anti-roll bar and in order to have the lightest possible point of attachment the rear spring dampers are of piston type bolted on to short brackets welded on to the side member of the frame. The wheels themselves are of the steel disc type with ventilating holes to assist in cooling the Lockheed-operated brakes which are of the two-leading-shoe type on the front wheels and largely in consequence of drum width of 1¾ in., have a bigger than usual friction lining area. The bodywork of the car has been designed with a view to economical production, rigidity, and moderate drag. The nose of the car is sharply swept down to a rectangular, horizontal air inlet from which the air is ducted back towards a vertical radiator core. 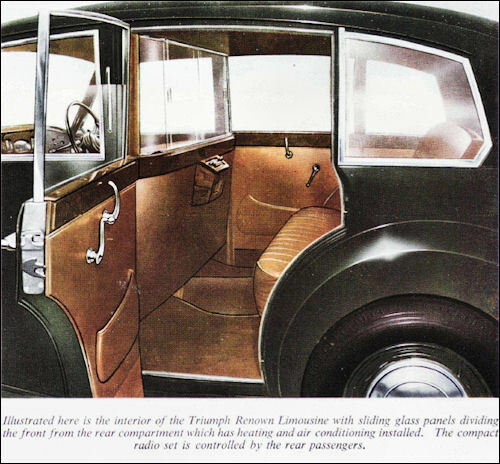 The bonnet has outside hinges attaching it to the scuttle and the separate front wings are bolted on and swept right through the doors to meet the rear panel. The body sides are very sharply cut away so as to provide ample elbow room for the driver and although a single-piece flat windscreen set at an angle of 40 deg. from the vertical is supplied as standard, it is quickly detachable and provision made for alternative aero-type screens. The rear wings are bolted on to the main structure of the body and can therefore be quickly replaced if damaged. Two separate bucket seats are mounted within the cockpit, which has an interior width of 47 in. These seats are of hammock type upholstered in leather and the body space behind them is entirely free for luggage, as the spare wheel is externally mounted in a recess formed in the back panel of the body. In view of the fact that the whole of the engine and gearbox assembly is behind the front wheel centres, and the fuel tank and the contents (weighing up to 85 lb. ), and spare wheel, are both behind the rear wheel centres, the car should have a distribution of weight as between the front and rear wheels appropriate to a high performance vehicle. A three-spoke steering wheel is used and the instruments comprise a tachometer and speedometer each of 5 in. diameter placed immediately in front of the driver, with a separate centre panel containing water temperature, petrol, and oil pressure gauges. There is also an ignition warning light and headlamp main-beam warning light. An open glove compartment is placed in the facia on the side remote from the driver, and refinements which are worthy of mention are the spring counter-balancing of the bonnet so that it may be quickly lifted, and the fuel filler cap placed within the spare wheel hub centre and fitted with a lock. Separate side lamps are mounted in the top of each front wing, the headlamps being semi-submerged in the front cowl. Semaphore-type direction indicators are not fitted but as an option the two tail lamps can be used as winking direction indicators in countries where this is permissible.